AlphaBrain is one of the brain health supplements that claim to provide various amazing effects to the brain. The main aim of the formulation of this supplement is to assist you in improving your concentration, making your mental response alert and also to enable clarity of speech. It is specially designed to help those people who feel hesitant about speaking in front of a public. It states to settle their worries and stress and makes them feel confident and comfortable in their gesticulations. According to its maker, AlphaBrain also helps shy and tired people. 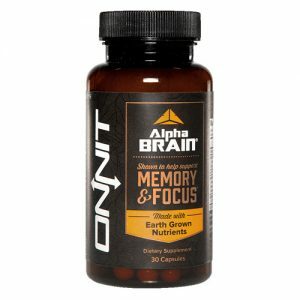 The manufacturer of AlphaBrain is the Onnit Labs. This company claims to be the world leading company in producing healthy and nutritive supplements. They claim to be real people who work according to their set goals, and these goals are mainly service of human well-being. According to them, people do not have time to go for intake of each and every vitamin, so they have created products that richly contain all important nutrients within one pill. They offer DNA repair supplement, brain health natural supplements and a wide range of other products for the healthy and strong body. Onnit Labs is known for having excellent records. The recommended dose is 1 capsule per day at breakfast time. For advice and additional information about this supplement or helpful tips, you can contact the manufacturing company directly at the following phone number: 1-855-666-4899. AlphaBrain comprises natural ingredients, all have different beneficial influences on the body. These include Vitamin B6, GPC Choline, Oat Straws, Huperzia Serrata, GABA, Vinpocetine, Mucuna Pruriens, AC-11, Pterostilbene, and Bacopa. GPC Choline is known to help the brain in the learning process as well as in increasing the levels of acetylcholine. Vinpocetine is the blood flow enhancer. Likewise, each of these ingredients possesses countless valuable effects. It is stated to be a balanced nootropic, which provides a number of useful effects. It claims to help those individuals who are less confident and feel hesitant about speaking in front of a public. It declines feelings of stress and anxiety. It works to enhance the acetylcholine levels in the brain and different neurotransmitters such as dopamine and serotonin etc and thus provides calming and relaxing effects to the mind. The presence of vinpocetine enhances the flow of blood and subsequently delivery of oxygen and other useful nutrients to the brain. AlphaBrain claims to make your sleep peaceful, your mind sharp and speech clearer. There are many positive reviews present regarding the effectiveness of this supplement. Many people find it very useful so this product seems fair in its claims. AlphaBrain was reviewed by hundreds of Amazon customers. How Much Does AlphaBrain Cost? You will find AlphaBrain at an affordable price plus its company offers 100% money back guarantee. You can also get a great deal on Amazon from various sellers. All of its ingredients are well absorbed and well tolerated by the body. Furthermore, these are all water soluble, so this product is free of adverse effects. Still, if they occur they will be of minor importance and will vanish shortly. Women who are pregnant should not use it, as there is no safety data available for its use during pregnancy. Similarly, its use is contraindicated for breastfeeding mothers. They must consult their doctors before going for such supplementations. Avoid using supplements of any kind before discussing with your doctors. AlphaBrain can be ordered online from different places but our recommendation is to either buy it directly from the manufacturer or purchase it from trusted online retailers which may offer you significant discounts. We did a research on other products from Onnit Labs. Here is a complete list.